As I have read through Brother Lawrence’s conversations and letters, I have not found any direct mention of the Scriptures. It seems that God’s presence and His Word were synonymous to Brother Lawrence. He sought God’s will and pleasure. Part of the rhythm of his monastic life included recitation of the psalms throughout the day at appointed times. I believe his life must have been drenched in God’s word. His heart was tuned to GOD in word, in thought, in prayers for others and in his everyday business. His aim was to be conscious of GOD every moment. God’s word was alive and active in his soul, leading Him to seek God’s will and even relying on God to accomplish that will, both specifically and generally. He offers his acts of obedience to God, and I love how he give thanks to God after completing His will. In all his ways, he acknowledges that God alone enables Him to do good. As I continue this practice of GOD+ART, I pause to celebrate and thank GOD for creating time and space to worship HIM. Oh, what love and goodness, Jesus lavishes on us every moment. What are you celebrating in your relationship with GOD? Love this Kel…both your insights and His, and always, always your quotes from God’s Word! Powerful! I love to lace my journal prayers w/ Biblical quotes, especially from the psalms. King David gives us language to express and explore our emotions. Sometimes I use snippets of His phrases and interweave them with my own. I’m so grateful that God even gives us the lanuage of our longings. I am totally bummed that I still can’t get your gorgeous collage photos anymore. Something has totally gown awry w/ thtis crazy computer! Ugh. 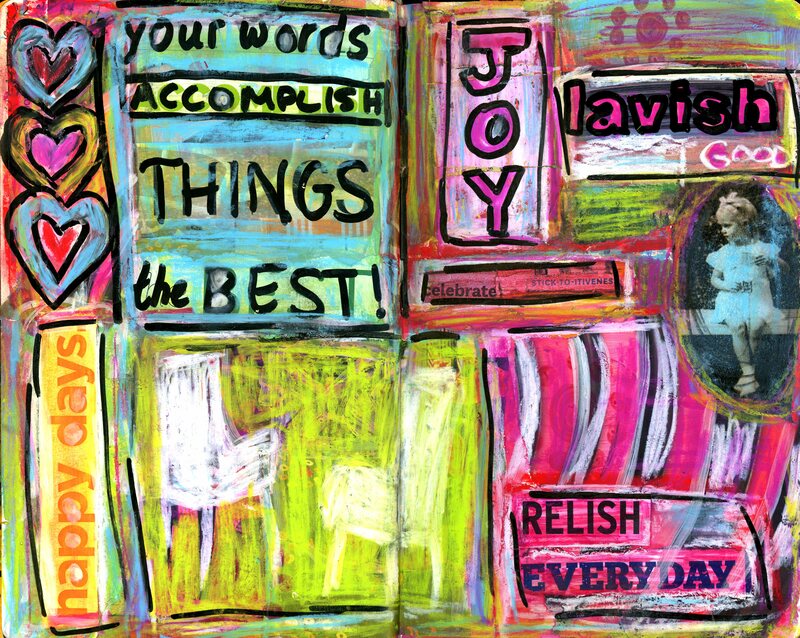 That is a bummer about the images…I love how you weave God’s word into your journaling…I am creating the collages in a journal and scanning them for the website…I will bring the journal to our outing this weekend, OK?